Jellybean Games has launched their kickstarter campaign for Brains!, a zombie-themed card game for all ages. Brains! 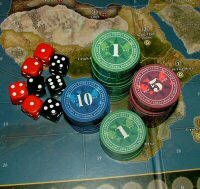 is the third game in the Treasure Hunters series; a set of games that can all stand alone, or be shuffled together. The first game – Scuttle! – was pirate-themed, and made more than $87,000 on Kickstarter in 2016. The follow-up – Ninjitsu! – featured ninjas and cute woodland animals, and earned over $120,000 at the end of last year. From the designer of Dracula’s Feast and The Lady and the Tiger, ?with stunning art provided by Kelly Jo (Hidden Panda), the game introduces a novel ‘graveyard-building’ mechanic. Cards can have a special effect when discarded from your hand or from your collection; the timing of discards can be a powerful tool, and a key to victory. As with all Jellybean Games, the rules are straightforward and easy to learn. Each turn, players either draw two cards, play a card from their hand, or bury the top card of the deck and move it straight to the top of their graveyard. Cards can be played either for their ability, or as a treasure. The first player to have twenty-one points of treasure in front of them is the winner. An expansion is to be released alongside the game: Burial! adds fifteen unique cards and an additional suit to the deck, allowing it to serve as a set of playing cards. The new cards play heavily on the graveyard building aspects of Brains!, and ensure that every game is unique. Brains! is for 2 to 5 players aged 8+, and is currently on Kickstarter. A retailer pledge level is available.